This recipe is an adapted version of my friend Nyla’s crockpot pinto beans. One taste of these perfectly delicious beans and you’ll be convinced there’s no need to ever purchase canned beans! And if you like refried beans, I’ve included directions for using these beans to make homemade refried beans as well. The afternoon/evening before you plan to serve the beans, place 2 cups of dried beans in colander and pick through them removing any small stones or other foreign matter. Rinse the beans well and place in a large glass bowl, or remove your ceramic crockpot from its base and soak directly in the crockpot. If you have time, ideally, it's best to drain the beans, rinse them and put them back through this same soak process again (which would extend the soak time and help to further reduce phytic acid, and further increase digestibility). Once soaking time is complete, drain and rinse beans thoroughly. Place beans in the crockpot with rest of ingredients. Cook on high for 7-8 hours, or until beans reach desired softness. 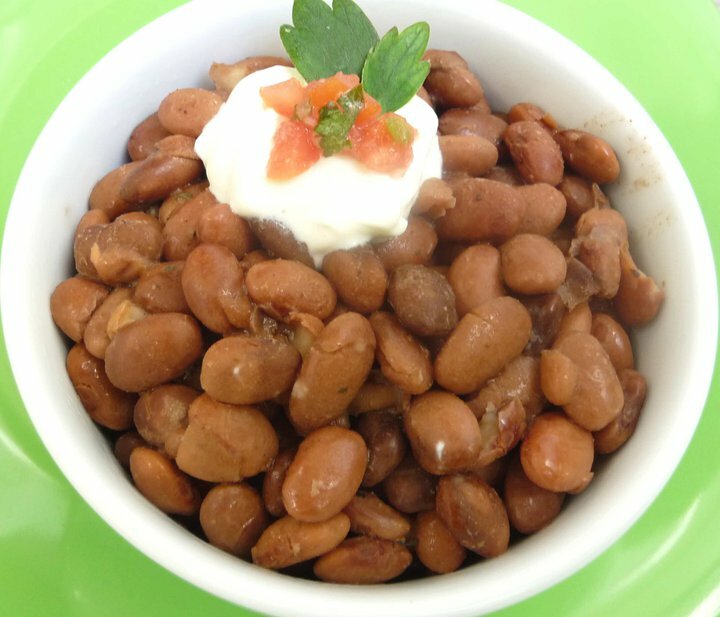 Use leftover beans to make refried beans(see recipe below). Homemade Refried Beans recipe: You can easily make refried beans using this same recipe. Simply cook the beans until they are very soft and can be easily mashed between your thumb and index finger. Then, use a potato masher to mash the beans, adding a little olive oil, if necessary, to reach desired consistency. (I like to leave a few bean lumps, but if you like them really smooth, you can use an electric hand mixer to get them really smooth and creamy.) Mmm! Oh my goodness…I cooked these beans today and they are to die for. Thank you so much for the recipe! I’ll be cooking these on a regular basis….YUM!!!!!!!!! Do you leave the oven light on to remind you that the beans are in the oven or does it serve some other purpose? Also, I’m assuming that you are of the opinion that no acid is needed when soaking beans. I read your post about soaking and realize it is unclear the conclusion on beans. In seeing this recipe, I assume you come down on the side of not adding anything but water to the soaking process. Just wanted to make sure. Thanks! Thanks for your time and response, Kelly. I really appreciate it. Can’t wait to see how these beans turn out for dinner tonight. I’ll keep you posted! Hi, just a question – as I don’t have a crock pot – but do you use the old fashioned type with the ceramic bowl or the new fancy (and bigger) ones? I can get access to an older style but wondered if I should invest in a newer one. I have never soaked legumes with an acid medium and got the beans to cook!! 🙁 No acid. Just water. I don’t recommend using an acid medium with beans either, just warm water. Some experts recommend using a little baking soda, but I find it makes the texture of the beans undesirable. Sorry if this seems obvious –is the measurement of beans for already soake as it says or or for dry?